Cost: The sakura menu costs £34 per person inclusive of a cocktail, miso soup, two bento boxes including sushi and sashimi and a hot main course. Dessert is available for an additional £8.50. 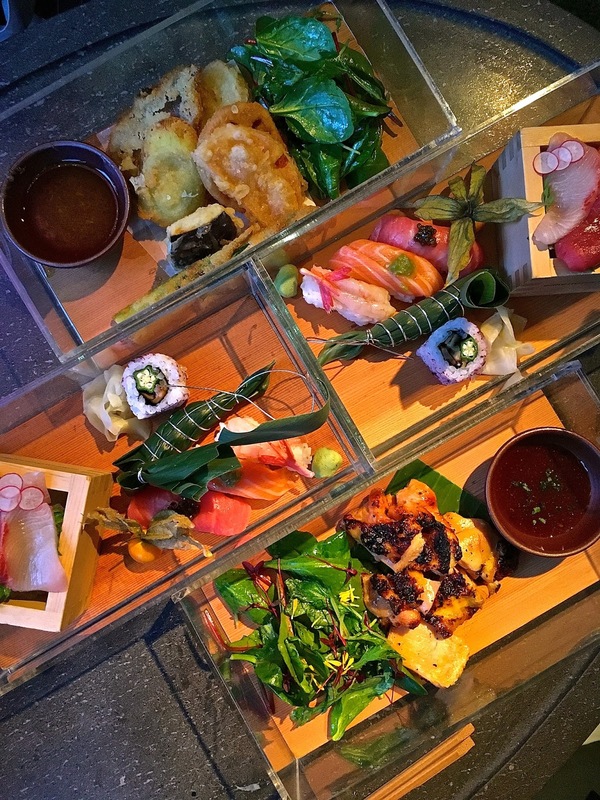 About: Part of the fabulous Hakkasan Group, Sake no Hana's restaurant on swanky St James Street, in celebration of the Japanese cherry blossom season (sakura), is offering a special menu created by Head Chef Hideki Hiwatachi. 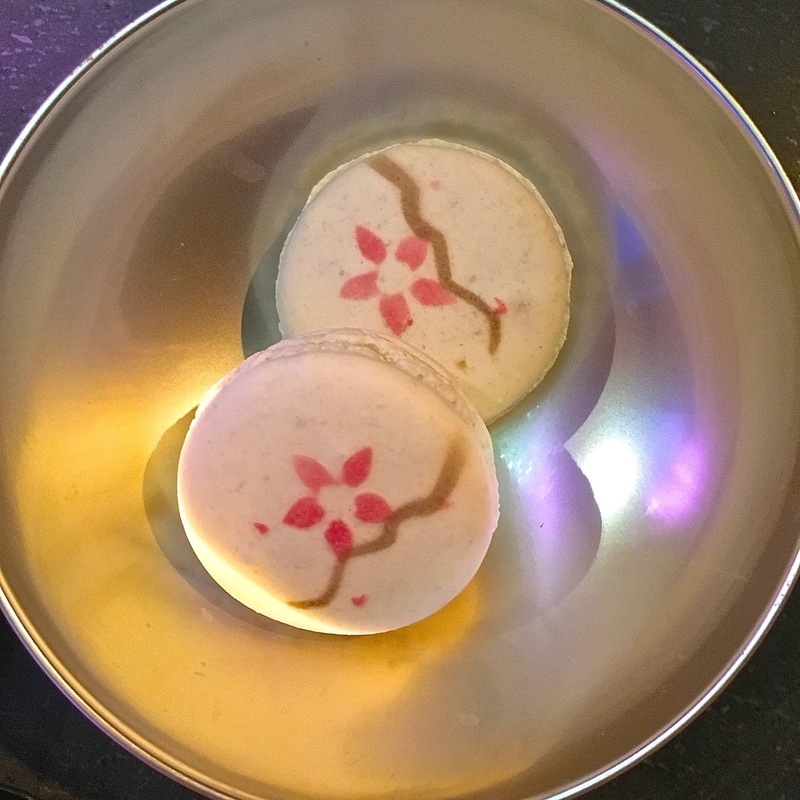 The sakura menu will be served until 18th June, and for the duration of the menu, the entire restaurant and bar are decked out in pretty cherry blossom, making for quite an atmospheric spot. The menu is available at lunchtimes in the restaurant, while at dinner time it is served in the ground floor bar, and this was where we had our meal. What We Ate: The menu kicked off with a steaming white miso soup with edamame bean tofu, spring onion and wakame seaweed. 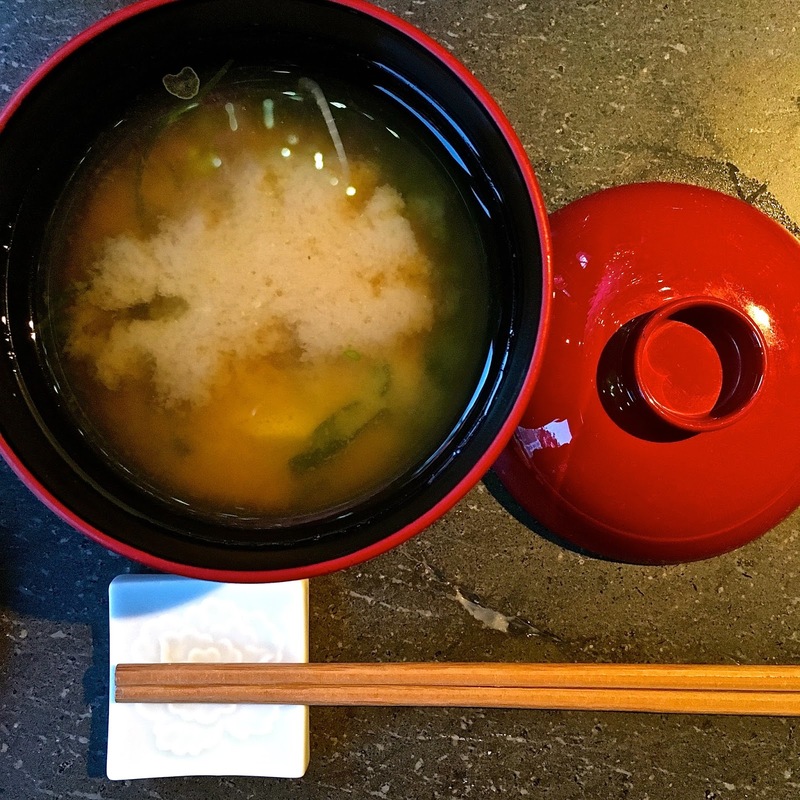 I enjoyed this soup – the dashi broth was well made and delicate while the addition of white miso gave it a delectable savour. I particularly enjoyed the nutty, jade-green edamame tofu cut in the shape of a lotus flower. For our main courses, we ordered two different dishes to share. The chicken sumiyaki with spicy shichimi sauce was served in a perspex bento box with an accompanying green salad dressed with a citrus yuzu-pon dressing. The grilled chicken was well flavoured and succulent, served alongside the spicy shichimi sauce made of sesame oil, soy sauce, Japanese 7-spices, garlic, ginger and a hint of wasabe. The other main, also served bento style, was the seasonal vegetable tempura which included slices of pumpkin, onion, asparagus, aubergine and lotus root. Delectable though it was, unusually Sake no Hana's version uses breadcrumbs rather than the more traditional tempura (wheat) flour, so this was not tempura in the traditional sense. Now onto the raw fish bento – a selection of sushi and sashimi – super-fresh slices of yellowtail, red tuna and salmon, were served chilled over ice and beautifully presented in a bamboo sake cup. A delicious trio of nigiri sushi included fatty tuna, salmon with chopped wasabi and sweet shrimp. The vegetable shiso maki had crunchy okra with dried sweet plum, while a forth seabass nigiri was nattily dressed in an aromatic bamboo leaf. Dessert is not included in the fixed price, but we could not resist the cherry chocolate sake mousse (£8.50). 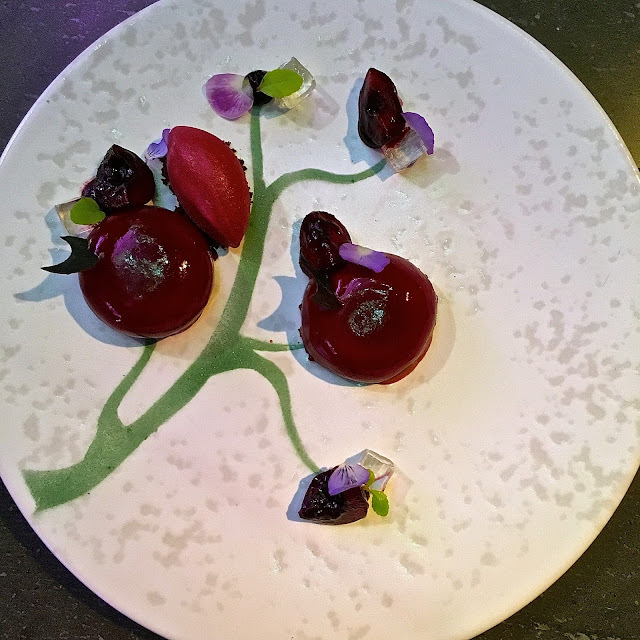 This had cherry chocolate and cherry sake mousses, chocolate crumble and sake jelly, glamorously served on a plate decorated with a green chocolate 'tree', with fresh cherries. Vanilla macarons came filled with chocolate and green tea ganache (£1.80 each), and had a perfect crisp coating with an indulgently gooey centre. What We Drank: The cocktail on offer for the sakura menu is a Kaori Arpège, a heady and gorgeously presented mix of Beefeater 24 gin, yuzu sake, cherry liqueur, peach bitters, grapefruit juice and agave. 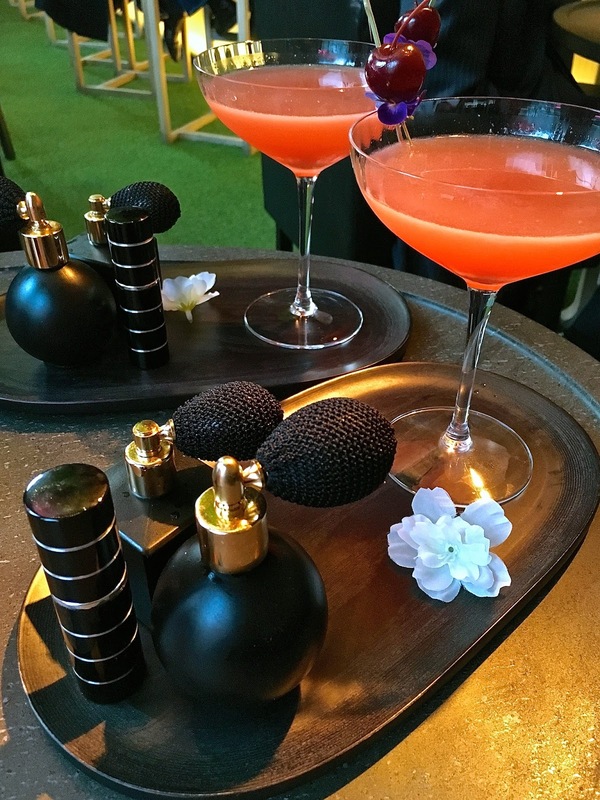 It was served with a selection of 3 spray perfumes - cherry and cinnamon, jasmine and elderflower, and violet. Diners are invited to spray the perfume around the cocktail, one fragrance at a time, and savour the different flavours and aromas. With our meal, we shared a small carafe of Kozaemon Sakura Junmai Ginjo sake (£18.80). A limited edition sake available only during sakura season, just a few hundred bottles are produced each year. Opalescent, off-dry with barley, savoury and meaty characteristics and a rich complex finish, this was rather like a top quality, long-aged amontillado sherry. Likes: The cocktail, sushi and sashimi and desserts were delicious and gorgeously presented, and great to experience in the beautiful cherry blossom setting. Dislikes: During dinner service, the bar lacks a little atmosphere. Verdict: If you haven’t visited the fabulous Sake no Hana yet, the sakura menu at £34 is a great reason for doing so, and it will not break the bank. But rush because the menu ends on 18th June 2016. Recommended. I love the sakura menu this year and I'm glad they added a main course to last year's set deal.